It’s turkey feast season (not only for Thanksgiving) !! It does take a while but it is actually only waiting time and it is soooo worth it! With this recipe you will be the Superhero of your next diner party! Preheat oven to 160°C. Bring water and the stock cubes to a boil and let simmer. Mix olive oil with herbs, salt and pepper. Rub turkey with this mixture from inside and out and also between breast skin and meat by lifting the skin with the fingers and rubbung the mixture underneath. 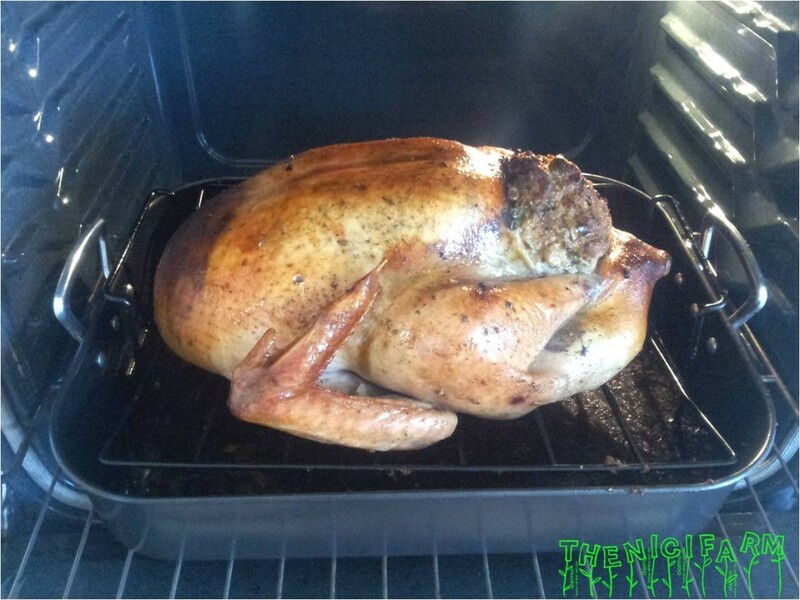 It is pretty gross but it makes the turkey nice and juicy. Place turkey on a rack in a large enough pan to hold the turkey. Mix all the stuffing ingredients and work it through with your hands until you have a dense but not too sticky mass. Stuff the stuffing into the chicken openings as dense as possible. Pour 2 cups of soup on the bottom of the roasting pan. Place into the oven. I use the rule of the thumb for baking: 30 minutes per kg turkey. It is very important to pour soup over the turkey every 15-30 minutes for the turkey to be delightfully juicy. To test for doneness you can cut the skin between leg and breast. The liquid comeing out should be translucent and not pink when it is done. Or a thermometer inserted into the meat should show 70 °C. This entry was posted in Main dishes, Yummy for my tummy.